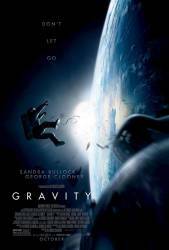 Factual error: When Sandra Bullock and George Clooney manage to get to the ISS, she gets entangled with some ropes and manages to grab Clooney's safety rope. Clooney's speed should be very close to Bullocks' and the ISS', hence. The parachute ropes should be able to withhold the forces of deceleration (the mass of two people is very small, compared to Soyus or ISS), so no more pulling or having to sacrifice himself... This is due to the fact that there's no drag in space to constantly change Clooney's velocity (revert to Newton's First Law). Suggested correction: The parachute ropes are of course strong enough to hold the relatively low kinetic energy of the drifting astronauts, but that is not the reason why Clooney detaches. The rope is not attached firmly to Bullocks' leg. There are some loops loosely wrapped around her leg, and while both astronauts are still drifting away from the ISS (seen in a shot a few seconds earlier), those loops slip away from the foot one by one. Before the last loop slips away from the foot, untethering and condemning both astronauts, Clooney detaches himself to lessen the kinetec energy that pulls on the rope by reducing the total mass of the "system of two astronauts", so that there is a better chance that the last loop will remain attached to Bullock. Actually parachute cords can withstand hundreds of pounds of force, making them very difficult to snap. 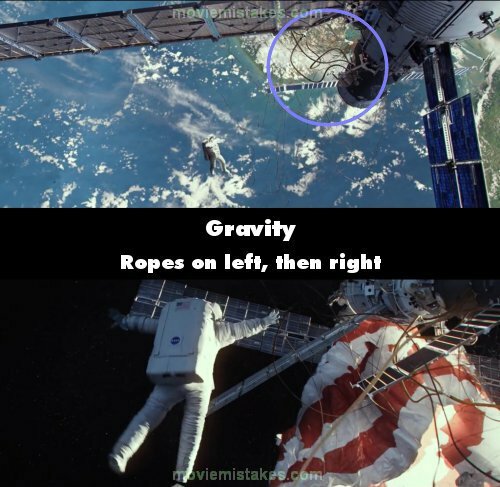 Factual error: When Ryan, and Matt reach the space station, they cause the space tether rope to break. This could not have happened in real life. Space tether ropes are very difficult to break even with hundreds of pounds of force.